Today is Day 17 of the Self-Esteem Challenge, originally from Better than Dark Chocolate. It’s a series of questions and prompts to get you thinking about your good qualities and things that make you happy or proud. See my introductory post for more info. What do you do to feel calmer when you’re stressed? When I feel stressed the first thing I do is try to breathe deeply and give myself a chance to clear my head. Sometimes this means leaving the room and getting some fresh air before I explode! Sometimes I even need a few tears and releasing it this way actually makes me feel better than bottling it up. I sometimes try to remember positive quotes and little mantras I’ve picked up. Then it helps to talk to someone about why I’m stressed and try to be proactive about changing the situation. For example, if I’m at work I might explain how I feel and ask for some more support with my workload. Taking proactive steps to find a solution to what’s making me stressed or manage the tasks and get organised makes me feel much better. I usually like to spend time on my own when I’m stressed, preferably outdoors in a peaceful place like a park where I can sit and daydream or read a book. I’ve found that when it’s hot I get stressed and flustered more easily, so I keep myself well hydrated with nice cold drinks and that calms me down pretty well. In the winter a nice hot chocolate does the trick, and I like to pamper myself with a warm bath and some relaxing essential oils, followed by snuggling on the sofa and watching an uplifting DVD. Before bed I always like to unwind by watching something with Matt and then reading a few chapters of whatever book I’m on. Even if I’ve had a very busy day, these simple things make me feel like I’ve had some ‘me’ time and put me in a better frame of mind for the next day. I like to rub a bit of essential oil into my wrists and temples or spay a lavender spray on my sheets to help me drift of. 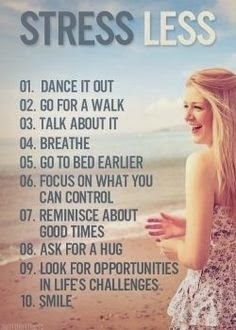 What do you do to calm down when you’re feeling stressed?